This is an antique solid mahogany table that we have painted using Annie Sloan paint, first in Graphite and then in Country Grey (which is a beige colour). We have heavily distressed this piece so that under colour is very visible, then as a contrast we have added new cut glass handles with silver backings. 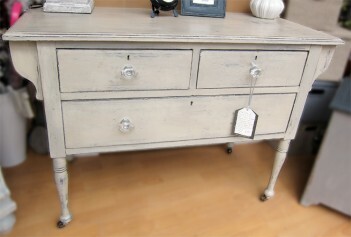 This piece could be used as a hall table, dressing table or a washstand. Original castors. width is 107cm by 48,5cm deep and 73cm tall.